Shazam! 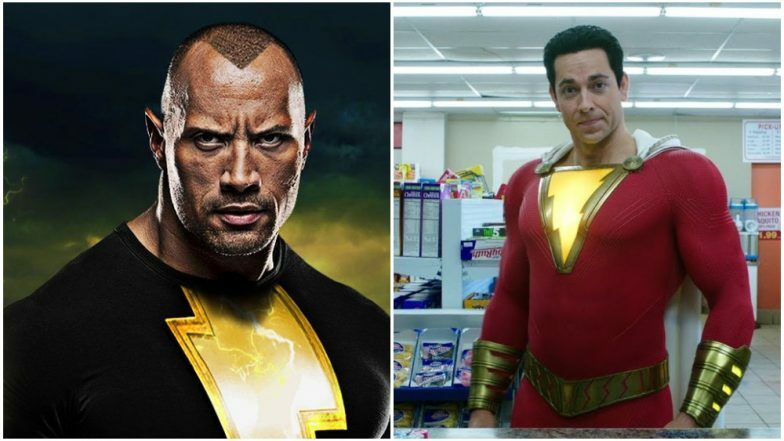 : Did You Notice Dwayne Johnson’s Black Adam in Zachary Levi’s Superhero Film? Shazam! is cruising smoothly at the global box office with the superhero movie impressing both the fans and the critics. With Avengers: EndGame releasing only by April 26, DC and Warner Bros should do well to utilise the gap between the films to bolster the box office earnings of Shazam!. But going by how Zachary Levi's film has been received by the audiences, there is no doubt that the studios have another winner from the stable after Wonder Woman and Aquaman. Time for them to have another try at the Justice League, what say? Dwayne Johnson Reveals That He Is The Reason Why Shazam Doesn't Have Black Adam! Watch Video. Shazam! has been filled with enough Easter Eggs and surprises that have satiated the superhero geeks. There are enough nods to Superman, Batman and even a joke was thrown in towards Aquaman, as well as the Harry Potter series too. Why, director David F Sandberg even threw in a wink at his popular horror film, Lights Out. (Some SPOILERS ahead. So be careful when reading further) Not to mention, a 'cameo' by Superman towards the end of the film. But have you noticed a cameo of Black Adam in the film, touted to be played by Dwayne Johnson? No, Johnson doesn't appear in person in the film, but his character does, only he goes unnamed. This happens when Billy Batson (Angel Asher) meets the old Shazam (Djimon Hounsou) in his 'lair' and Shazam explains to him the history of his as well as the council of Wizards. Presented through holograms, Shazam tells how they created an ultimate champion, who turned bad and nearly destroyed the world. That champion who looks quite similar to Shazam in his superhero form is Black Adam. For those who are not aware of this, Shazam! has been in the planning stages since 2008. While the leads of the film were not announced then, it was then confirmed that Dwayne Johnson would make his debut in DC Universe as the antagonist. He would have been playing Shazam's primary rival, Black Adam. Shazam Movie Review: Zachary Levi’s DC Superhero Film Will Make the Child in You Jump in Glee!. Since then, the movie's development has seen its ups and downs, which more or less, depended on how DCEU had been performing at the box office. So when Shazam! was in its final stages of planning, it was announced that Black Adam won't be appearing in the movie. Instead, he would be having a separate origin film. Dwayne Johnson continued to stay attached to the role, and if you see the credits scene, he is acknowledged as the Executive Producer. Now, thanks to the success of Shazam!, Dwayne Johson has nearly confirmed that Black Adam the movie is on the way. He said, "Black Adam is an anti-hero or villain that I can't wait to play. I've been developing this and it has been with me in my DNA for ten years now. We should start shooting that in about a year. Very excited about that. I can't wait to play Black Adam.... 'Cause they are all getting their a-- kicked when I play Black Adam. That day of reckoning is coming for everyone." Well, will Black Adam be the Loki of DCU? Let's wait and watch!